Billericay Ladies passed their final test before this week’s County Cup Final with a battling 2-1 home win over a resolute Cambridge side. Taking the lead from a 12th minute Danica Dougal penalty, the Blues were soon pegged back by the visitors’ in form striker, Mollie Coupar. It would be a successful afternoon for the Essex side as Zoe Rushen shot home early in the second period to secure the win. 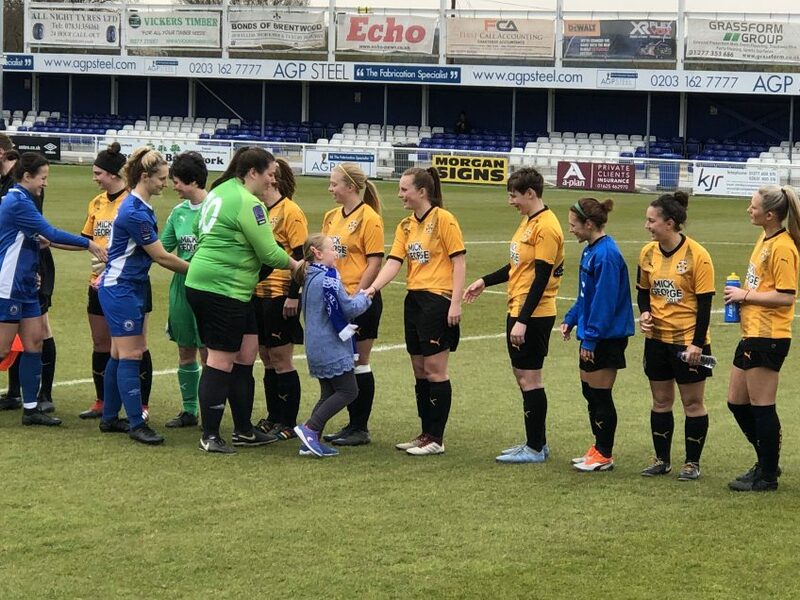 On a bright, sunny, Sunday afternoon, a growing throng of footballing cognoscenti were at the AGP to take in the final Ladies home League match of what has proved to be a very successful campaign. Promoted last season to the South East League Division One – the fourth tier – Billericay had been anticipated by some to struggle at the higher level. It would not turn out to be as the doomsayers would have had us believe with Blues the only challengers to eventual Champions, Crawley Wasps. That the team thrived, including a best ever run in the Women’s FA Cup, is testament to a combination of canny recruitment, experience of coach, Kim Coster, and strong team ethic. 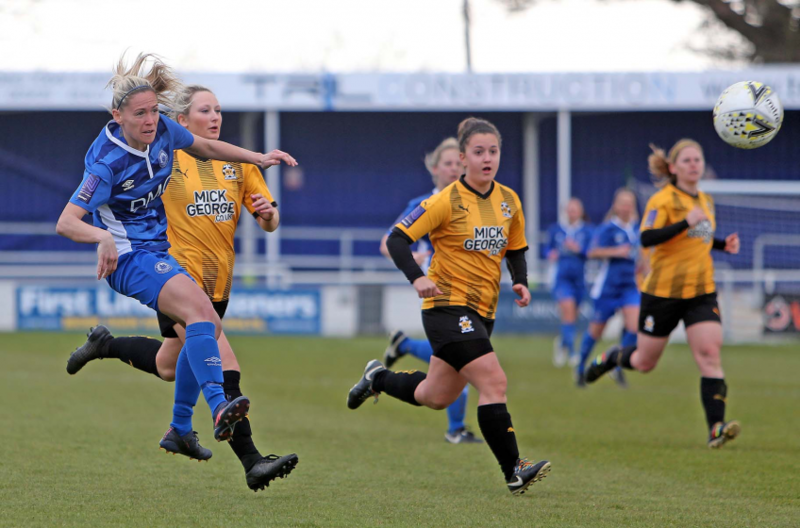 With a strong defensive record built on a tenacious back-line, and hard working midfield, Billericay Ladies also possess a plethora of striking options. 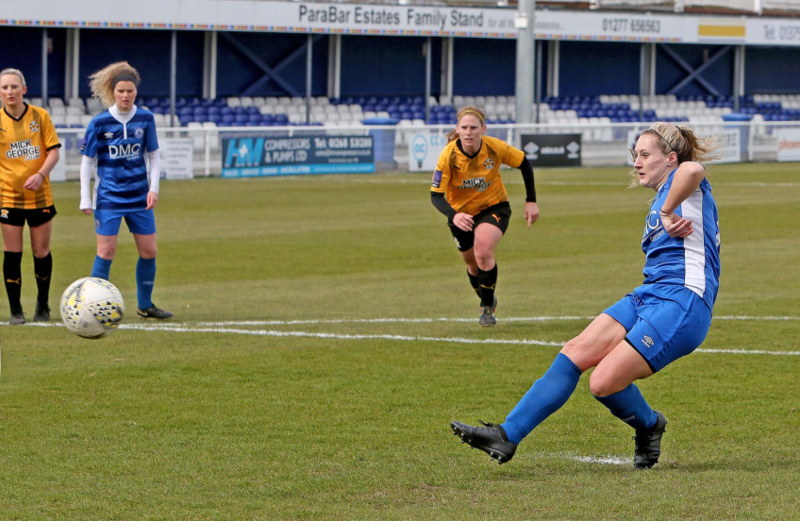 In attacking areas, Rushen, Jay Blackie and Karissa Rodney – all summer signings from local rivals C&K Basildon Ladies – each offer contrasting threats. Sam Pittuck, formerly of tier three Charlton, has also been influential up front since joining last summer. 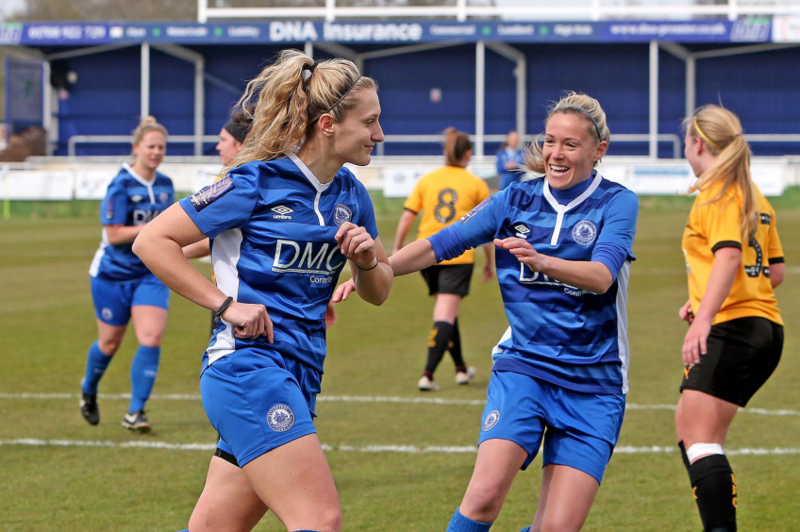 Coster made three changes to the Blues line-up that had so impressively won 1-0 away at Crawley Wasps at the end of March, forcing the league leaders to put their title winning celebrations on ice. That Billericay were the first team to defeat the back-to-back title winning Sussex side in two years higlights the achievement and indicates the exciting potential of the Essex side. In for Billericay came Alex Baker in goal in place of Nikita Runnacles. With Courtney Lumley dropping to the bench, Nicole Farmer came in at right back and Pittuck was selected in a striking role instead of Rodney. Cambridge United arrived with a string of positive results in March, netting Kevin Hoover manager of the month. The traditional curse attached to the award had struck with a subsequent 6-1 away defeat in April at Crawley. Hoover made four changes from that outing, bringing in goalkeeper Liz Pamplin and installing Vicky Neal back to the centre of defence in place of Abi Davies. In midfield Charlotte Crisp and Jemma Moore replaced Amy Howlett and Albany Hodgson, both names substitutes. The match enjoyed a lively start with Billericay immediately on the attack. A characteristic of the Blues was the remarkable understanding between Rushen and Pittuck who completed swift inter-changes of passes all afternoon in the final third of the pitch. The first example on 2 minutes saw Pittuck as provider serving Rushen who span through clear on goal. Only a last ditch tackle from Neal that entailed an injury stoppage of two minutes to treat the Blues striker saved the day. Cambridge struck back on five minutes through striker, Coupar, full of confidence after a recent hat-trick against Luton Ladies. Pursuing a through ball, she would find herself clear on goal with the opposing keeper, Baker, rushing to intercept and out of her ground. A delicate lob followed with Coupar desperately unlucky not to register an early goal as her effort fell agonisingly wide. 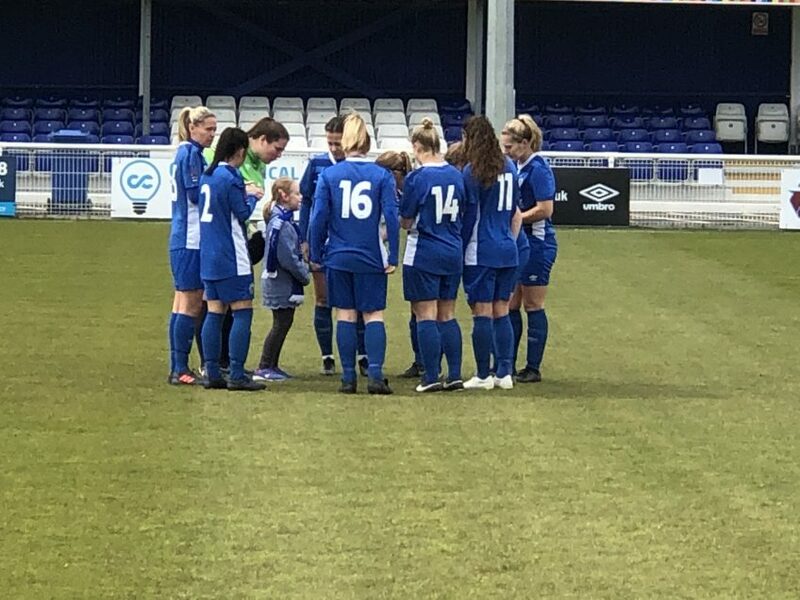 Billericay took the lead on 12 minutes through a Danica Dougal spot-kick awarded after Kerry Stimson had been fouled in a scramble after a Lucy Jones free kick had sowed panic in the vistors defence. With Dougal the scorer of the spot-kick that beat Crawley, it was no surprise that the ex-C&K Basildon defender would precisely side-foot home an expertly taken kick into the top corner. The visitors’ reaction to going behind was swift as Coupar latched onto a through ball in the 15th minute to advance on goal and, from the right side, drive a powerful shot into the far corner to equalise. Blues threatened immediately in response to the set-back as a clever set-up from the impressive Pittuck was hit wide by Stimson when well-placed. After patient build-up play in midfield from skipper, Lindsey Morgan and Jay Blackie, the Pittuck-Rushen attacking tandem would snap into action for the next threat on the Cambridge goal. Released by a clever ball from Pittuck, a vicious Rushen strike was saved by Pamplin. The keeper also clawed away a second effort after the rebound fell kindly to the Billericay striker. As the half progressed, the Blues started to dominate proceedings and Esme Lancaster became more influential with involvement in several attacking moves and a dangerous cross from the right side. On 36 minutes, Rushen showed clever movement to set up Pittuck who fired a rising shot just over. Last action in the opening half saw a rare Cambridge incursion end with a testing cross from right back Carrie Bennett, which was taken at the second attempt by Baker. Billericay made two substitutions at half-time with Courtney Lumley and Karen Stephanou entering play for Dougal and the energetic Lucy Jones who never stopped running. Both reinforced the left hand side with Lumley at left back and Stephanou further forward. Despite the changes, Blues continued as they had left off in the second half. An early Rushen break on the left side ended with a dipping Morgan shot passing just over the bar on 47 minutes. Blackie then followed this with an overhead that went close after more pressure from the left side. On 51 minutes, leading scorer Rushen would make the difference as she latched onto a through ball on the right hand side of the penalty area. From a similar position to that of Cambridge’s earlier goal, she replied with a precise strike across the goalkeeper into the far corner to give the Blues the lead. At the back, Nicole Farmer, offered a good outlet with a stream of accurate passes into the strikers. On 62 minutes, one of her flighted passes found Rushen who delivered an inviting cross. Met instantly by Morgan, lurking in the penalty area, the ball went narrowly wide. Whilst Blues had the most of the play, Cambridge’s left winger, Jade Bell, was a growing attacking presence full of pace and trickery. Impressive, especially in the second half, on 78 minutes, she robbed Farmer of possession and sped through on goal. Her finish did not match her good approach work as the ball was hit wide of the target. The visitors would nonetheless go even closer on 84 minutes as a floated Becky Shephard cross was headed against the Billericay post by Emma Jenkins. With no further scares, Billericay were able to work the ball around for the closing minutes and conserve the victory. Cambridge battled well and were always in the game, giving solid evidence of their improvement in fortunes since the turn of the year. The Blues will now hope to emulate the opposition today, who won their County Cup last month, and get a Cup win this Thursday evening at the Len Salmon stadium (Home of Bowers & Pitsea) versus third tier opponents, C&K Basildon.